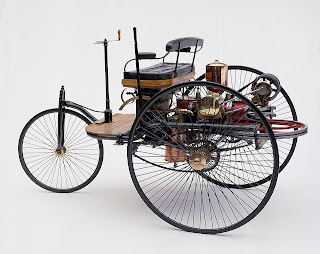 Today in 1886, German engineer Karl Benz received the world’s first patent for a practical internal combustion engine powered automobile, a carriage-like three-wheeler with tubular framework, mounted on a Benz-designed, one-horsepower, one-cylinder engine with tiller steering and a buggy-like seat for two. The engine was a refinement of the four-stroke engine designed by Nikolaus Otto (another German), who had refined his from Lenoir's two-stroke engine. Though the motorwagen was awkward and frail, it incorporated some essential elements that would characterize the modern vehicle: electrical ignition, differential, mechanical valves, carburetor, engine cooling system, oil and grease cups for lubrication, and a braking system.